Close to everything! Restaurants, arcades, and shops just across the street. Winter, Summer, Spring and Fall, Seaside Beach has it all! When you enter this lovely third (top) floor condo, all your cares will drift away. 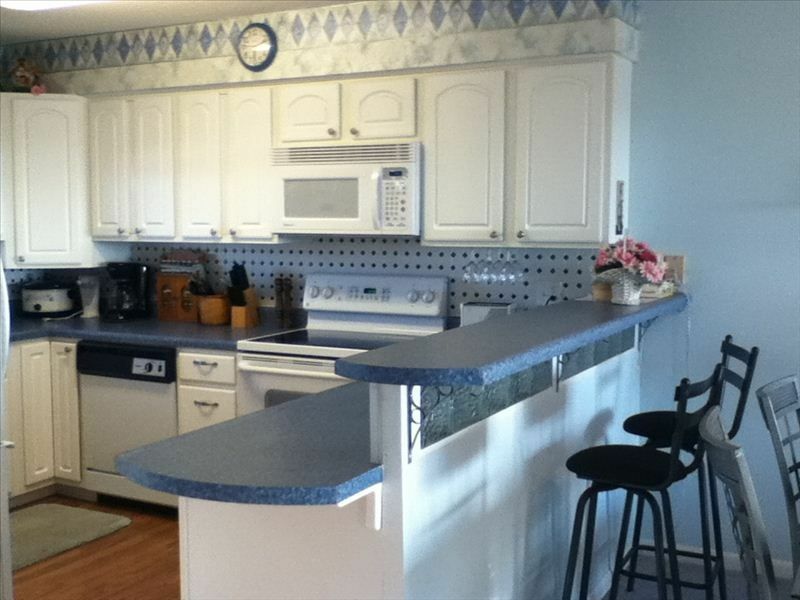 The kitchen is nicely decorated and well-stocked with many appliances. Just a quick trip to the nearby grocery store is all you need to make a home cooked meal for you and your family. The living room has two large, cozy recliners and a brand new queen size sleeper sofa. There is a big high definition TV equipped with a DVD as well as a DVD player/stereo in the living room. Free WiFi available. Want to play a game of tennis? We have tennis rackets and tennis balls in the condo waiting for you. Also provided are beach chairs, toys and board games to keep you entertained during your stay. The master bedroom has a comfortable king size bed. A set of twin beds are in the second bedroom. Crisp, clean and soft sheets are on all the beds. Soft, fluffy towels are in each of the two full bathrooms. One bath has a hairdryer for your use. There is a high definition TV/DVD provided for the master bedroom, and a high definition TV in the second bedroom . Also included in the condo is a stacked washer and dryer. This family friendly condo is located on the private tennis villas and is very convenient to shopping, entertainment and restaurants. Since our condo is located in Seaside Beach and Racquet Club, a gulf front complex, there is no busy street to cross to get to the beach. While our condo does not directly face the water, there is a water view from the balcony and there is a private walkway straight down from the condo that will lead you right to the sugar white sands. SPARKLING WHITE SANDY BEACHES, CLEAN GULF EMERALD WATERS AND PLENTY OF SUNSHINE FOR YOU TO ENJOY. Our family has vacationed in Orange Beach and Gulf Shores for years. We bought this condo because of its very desirable location and the many amenities that Seaside Beach and Racquet Club has to offer. View is from the balcony. Not a Gulf front unit. The condo complex has an exercise room. Two recliners and a sofa that makes out into a queen. Television (HD) is in the living room and in each bedroom. Private covered balcony with a view of the Gulf of Mexico. Well lighted tennis court. Play a game of tennis during day or night. Condo is steps away from the lighted tennis court, exercise and weight room, spa, sauna and clubhouse. Enjoy a game of mini golf or go-karts at the arcade across the street from the condo.